In the late spring and summer of 2016, Dennis and I set out to do a collaboration that we had talked about for some time. I would write poems inspired by his paintings. Dennis periodically sent me pictures of new paintings via his cell phone. I printed the images and began the writing process. I worked with one painting at a time, studying and meditating on it in search of a poem. The creation of each poem was always spontaneous, made in the moment of my contact with the painting itself. I would scribble notes on the back of each printed image . . thoughts, feelings, symbols, metaphors . . . whatever the image conjured or inspired. Eventually, a poem was found and created. I wrote one poem at a time, and did not move on to another one until I felt that the poem was finished. Dennis' work is very spiritually grounded. As in the case of his art, the poems focus on inner, unconscious forces, “gods and demons” if you will, that influence how we respond to the outer world and who we ultimately become, individually and collectively. Some poems were born out of faith in religious belief, some out of myth. Some simply grew out of reflections on history and personal experiences, or were inspired by local, national, and global events that happened that summer. Each painting and poem is unique, but there is a definite spiritual and psychoanalytical underpinning to what was imagined. 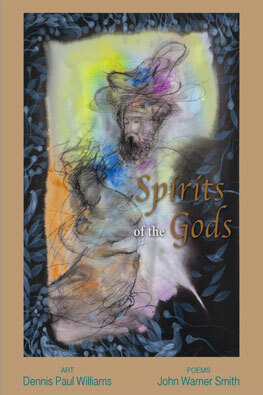 I hope that readers will discover that undercurrent when they see the paintings and poems side-by-side.